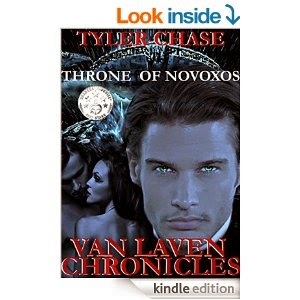 "THRONE OF NOVOXOS," by Tyler Chase, the first book of the VAN LAVEN CHRONICLES, is a gripping fantasy/sci-fi novel with elements of suspense, adventure, and even romance. The book revolves around Comron Van Laven, the heir to the Van Laven empire. Handsome, intelligent, and somewhat reckless, Comron plunges headfirst into dangerous situations, but always emerges without any complications ... until he gets involved with Vaush, an intoxicatingly beautiful woman who consumes him. Vaush gives enemies of the Van Laven empire with the leverage they need to strike a blow to the Van Lavens. From start to finish, "THRONE OF NOVOXOS" has a fresh, original feeling. There are futuristic weapons, such as blast rifles, and transport vessels, but there are also political conflicts reminiscent of the conflicts between medieval houses. There is a bit of a "Game of Thrones" vibe to that aspect of the book. One of the strongest aspects of the book is the action. Chase writes engaging action scenes that incorporate the novel's futuristic weapons seamlessly. The political tug-of-war between the political factions is attention-grabbing and well-done. "THRONE OF NOVOXOS"s plot is paced well, starting with with action (an execution scene) and continually gaining momentum until the end, perfectly setting the scene for a sequel. If you want a fresh scifi/fantasy novel, this is a must-read!